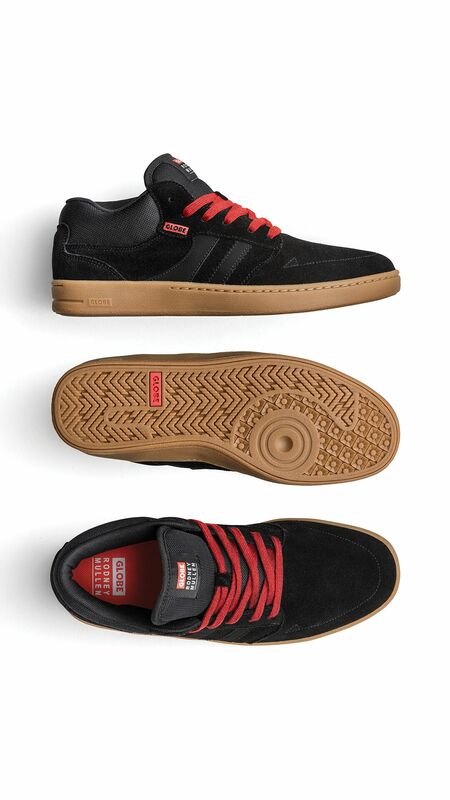 Globe announced the launch of the first Rodney Mullen skate shoe in a decade. The mid-top shoe features an asymmetric mid-cut height for added ankle support, alongside an internal stretch mesh sock for a custom fit and a PU Drop in Shockbed™ insole and Pro Am rubber cupsole for comfort and protection. Introducing Rodney Mullen’s new mid-top cupsole skate shoe designed and developed with features to support those who skate every day. With the last Rodney Mullen Pro shoe released in 2009, for over a two year period, Rodney has been working with Globe footwear designers on his new shoe’s conceptualization and design, painstakingly testing multiple samples and tweaking technical specifications over exhausting skate sessions. The resulting Octave Mid RM Black/Gum features internal stretch mesh sock construction for a custom fit, asymmetric mid-cut height for additional ankle support and protection, PU Drop in Shockbed™ insole and a Pro Am rubber cupsole, along with a shaved suede/mesh upper.